The IABR–Project Atelier Rotterdam, Urban Metabolism, is one of the three IABR–2014– Project Ateliers. The complexity of the city is exposed and studied, and new and unexpected relationships within the city are explored, offering urgent and relevant challenges and opportunities to the Rotterdam area. 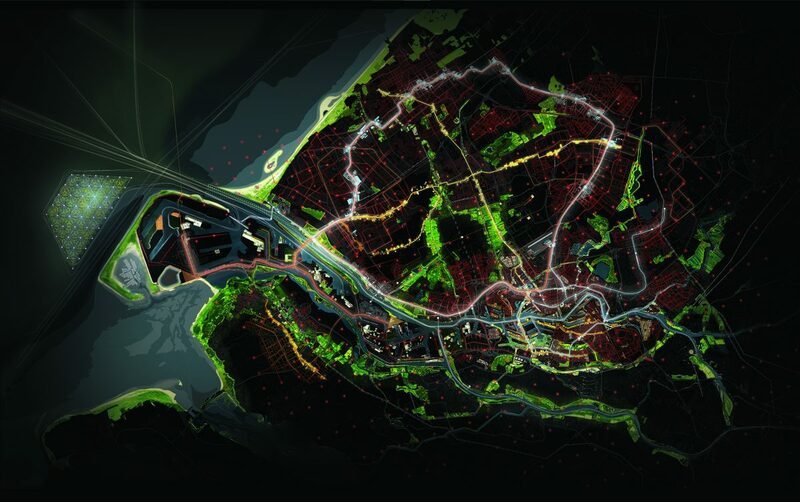 The research has led to a compelling analysis of our unique urban metabolism, resulting in a collection of spatial economic perspectives, ideas, and insights that will inspire us when building on a strong and sustainable future for the Rotterdam region. Urban Metabolism is a response to global trends. These trends will have an impact on Rotterdam and create opportunities in the city. Across the globe, densely populated areas, not coincidentally often located in deltas such as ours, are searching for ways to realize a resilient economic future, pressured by global issues like resource scarcity, energy and food shortages, environmental issues, and climate change. Deltas are also highly competitive as attractive habitats, with fashionable labels like Eco City, Smart City, Sustainable City, and Climate Proof City. To attract and retain talent and industry, it is crucial to create an urban ‘ecosystem’ where authorities, knowledge institutes, businesses, and citizens effortlessly manage to relate to each other. Global trends are developing towards circular economies. This implies a transformation of the current, linear economy, in which raw materials eventually end up as waste that is subsequently destroyed, into a circular economy, in which the recovery of raw materials is maximized and value destruction minimized. This development will generate new revenue models for the city. Increasing values of land, properties, and businesses in an everexpanding city and port are no longer selfevident. Spatially, the city will develop in a different way. In this changing environment, discovering and seizing opportunities requires an open mind.